448 pages | 279 B/W Illus. 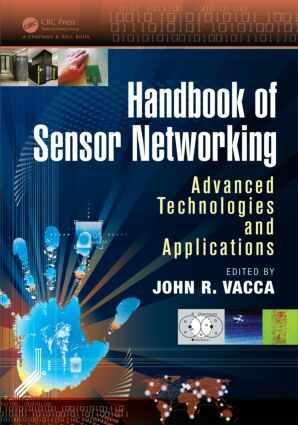 Handbook of Sensor Networking: Advanced Technologies and Applications provides a complete professional reference and practitioner’s guide to today’s advanced sensor networking technologies. The handbook focuses on both established and recent sensor networking theory, technology, and practice. Specialists at the forefront of the field address immediate and long-term challenges in their respective areas of expertise and explore practical solutions to a wide range of sensor networking issues. This comprehensive handbook is suitable for a range of readers, including researchers and practitioners, upper-division undergraduate and graduate students, sensor networking technologists and engineers, and security, law enforcement, and governmental agencies. The book gives readers a thorough understanding of the hardware of sensor networks, wireless communication protocols, sensor networks software and architectures, wireless information networks, data manipulation, signal processing, localization, and object tracking through sensor networks. "John R. Vacca has been a forward thinker in how omnipotent networks will work and envisioned many types of devices and functions that can be networked. His work in these areas is unsurpassed by other writers and visionaries. In this book, John has pulled together the knowledge that is needed for managers and developers to keep moving forward, and to do so faster, with sensor networking machines and devices that can perform both the mundane and complex tasks that are required for process management and production, which is necessary to propel enterprises and thus drive the global economy. Sensor networks are rapidly growing in size, scope, and functionality. This book provides a bottom-up analysis of sensor networking technology. It will enable managers and designers to create and deploy this important technological breakthrough." John R. Vacca is an information technology consultant, professional writer, editor, reviewer, and internationally known, bestselling author. From 1988 until his retirement in 1995, he was a configuration management specialist, computer specialist, and the computer security official (CSO) for NASA’s space station program Freedom and the International Space Station Program. He has authored/edited 76 books and published more than 600 articles. Visit his website for more details.